We're here for all your Juniper switch, Juniper router and Juniper security needs! CXtec is your source for Juniper routers, Juniper switches and Juniper security solutions. We provide Juniper switches and routers, as well as Juniper security solutions including firewalls, VPN, SSL VPN, and intrusion prevention. Here’s the real benefit to you: we’re committed to helping you get the most value from every Juniper solution you choose. When we say CXtec can help you get the best value in any Juniper security, Juniper router or Juniper switch solution you choose, we mean it. With our comprehensive knowledge, we understand the ins and outs of the Juniper solution model and how to pass those benefits on to you. We specialize and are certified in the innovative new Juniper EX switching line. The Juniper EX Series helps lower your total cost of ownership with unified management and automation tools to consolidate system monitoring and maintenance to save time and money. This is right up CXtec’s alley. 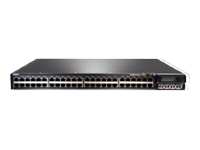 Juniper switches fit nicely into our trademark Technology @ Your Pace® philosophy. We always look for ways to get you the right solutions that work best for your time frame and budget. If we can lower your total cost of ownership in any way, we do. With the Juniper EX line you can do just that, yet still receive the same field-proven Juniper technology that powers the world’s largest service provider networks. CXtec offers a wide variety of core and edge Juniper routers. On the edge, Juniper routers provide unmatched reliability, stability, security, and service richness. They allow you to consolidate multiple networks into a single IP/MPLS infrastructure. In the core, Juniper Ethernet routers provide high port-density routing with applications including Ethernet LAN and data center aggregation, data center core, metro Ethernet aggregation and core, and Ethernet services edge. Trust CXtec to help you implement the right Juniper router solutions to get the most functionality out of your infrastructure. Juniper security products deliver industry-leading, identity-aware network security, access, and acceleration solutions that are dynamic and scalable. CXtec understands the Juniper security model and can help you institute infrastructure-wide strategies for maximum protection. Juniper’s Adaptive Threat Management Solution helps you achieve a sustainable competitive advantage that can be implemented over time, realizing the benefits of superior products that work better, because they work together. CXtec has extensive knowledge of Juniper intrusion detection and prevention products to protect you from worms, Trojans, spyware, keyloggers, and other malware and attain a fully-integrated Unified Threat Management (UTM) solution. We also specialize in providing the Juniper SRX Series. The Juniper SRX Series Services Gateways consolidate switching, routing, and security services in a single device, so you can economically deliver new applications and services.